What should be the correct position when driving? 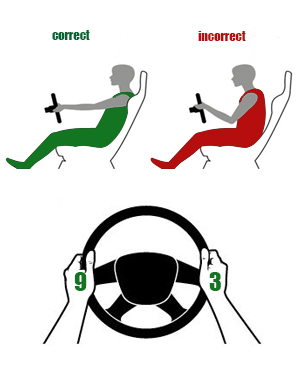 Correct body position allows the driver to feel comfortable behind the wheel. This condition is essential for both short and long distanced trips. You will feel less tired and less cramps when your sitting position is correct. We advise you before starting to drive to spend some time for correct positioning. It will take a minute or less, but it's worth it. Correct position means comfort and safety. It is important your back and shoulders to have full contact with the seat. Place your wrists over the top of the steering wheel to find out the correct position. The feet should be correctly placed as well. They should reach the pedals without difficulties. When your left foot does not pushes the clutch you can put it on a special place for that purpose. When you fix your seat next thing is to put your seat belt on and fix the mirrors. Remember the the correct position of your hands on the wheel is like the arrows of the clock when it shows 2:45 (the right hand on 3 and the left on 9). The thumbs must be placed on the spokes of the wheel. Most steering wheels are adapted for this purpose. Following this, you will shorten the time for reaction and will cope with the situation better.